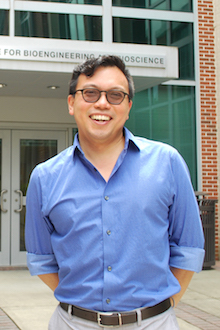 Wilbur Lam, MD, PhD is part of a research center, funded by the National Institutes of Health, that will develop and translate microelectronics-based point-of-care (POC) technologies for patient care. A new NIH-funded research center at Emory, Georgia Tech, and Children’s Healthcare of Atlanta will assist inventors across the United States in developing and translating microelectronics-based point-of-care (POC) technologies for patient care. The Atlanta Center for Microsystems Engineered POC Technologies (ACME POCT) will be funded by a $7 million, five-year grant from the National Institute of Biomedical Imaging and Bioengineering of the National Institutes of Health. Point-of-care technologies are medical diagnostic tests performed outside the laboratory in close proximity to where a patient is receiving care. This allows health care providers to make clinical decisions more rapidly, conveniently and efficiently. The ACME POCT will be part of the national NIH Point-of-Care Technologies Research Network. The Atlanta network will assist and enable inventors of POC technologies for cardiac, pulmonary, hematologic, and sleep applications to translate them to improve patient care. Principal investigators for the ACME POCT are Oliver Brand, PhD, a microsystems engineer, professor at Georgia Tech’s School of Electrical and Computer Engineering and director of Georgia Tech’s Institute for Electronics and Nanotechnology; Wilbur Lam, MD, PhD, associate professor of pediatrics at Emory School of Medicine and the Wallace H. Coulter Department of Biomedical Engineering at Georgia Tech and Emory University, and a clinical hematologist at Children’s Healthcare of Atlanta; and Greg Martin, MD, MSc, professor of medicine at Emory School of Medicine, clinical pulmonologist and intensivist, and head of the clinical research network in the NIH-funded Georgia Clinical and Translational Science Alliance (Georgia CTSA). One focus of the new research center will be microsystems-engineered technologies, a promising new class of microchip-enabled POC devices ranging from microelectromechanical systems (MEMS)-based sensors, to microfluidics, to smartphone-based systems. Examples include CardioMEMs’ heart failure sensor and Medtronic’s Carelink system for cardiac patients. “The ACME POCT will be able to leverage the extensive open-access micro- and nanofabrication facilities at Georgia Tech’s Institute for Electronics and Nanotechnology to refine microchip-based point-of-care technologies,” states Brand. Because of their small size and low power requirements, microchip-based systems provide excellent portability for POC testing. In addition, the ability of microsystems to convert sound and movement into electrical signals makes them ideal for sensing changes in the lungs and heart and diagnosing and monitoring pulmonary and cardiac disorders. The ACME POCT will assist inventors of microsystems-based POC technologies to define their specific clinical needs, conduct clinical validation, and refine their technology, directly addressing barriers with the objective of accelerating the path to clinical adoption. Atlanta’s highly ranked clinical programs in Emory Healthcare and Children’s Healthcare of Atlanta, as well as the internationally acclaimed microsystems engineering expertise at Georgia Tech, including the institute for Electronics and Nanotechnology (IEN) are expected to create a supportive and collaborative environment for the POCT center.